When it comes to delivery pizza in my area Papa Johns is the best. The pizza is always delicious and normally the pizza is always delivered in a timely manner. The one problem I have with Papa Johns is they have a small delivery area. In September my boyfriend Grant bought a house that is kinda far out from Brandon but not that far out. We ordered from Papa Johns and the website said that they delivered to the area. We then got a phone call from the store claiming that they didn't even though we had seen the truck go farther down the road from the house. We were like ok cool we will order and pick-up. Then we got an e-mail stating that they did now deliver to the area. We were super excited! So we called ordered a pizza and again they claimed not to deliver to the area. This time we said we got the e-mail and they delivered the pizza. We continued to order pizza and they kept claiming we weren't in the area. We ordered pizza a bunch of times. At one point we were unable to order off of the website. It was odd it was like they locked out the account. So I created a new account and ordered a pizza last night. 5 minutes later I got a call from the manager who rudely told me they would not continue to deliver to our area that we were out of the area and we would have to come pick up the order. I told her that it would not be necessary and to please cancel the order. Her tone and attitude were so rude I actually got on the Papa Johns website and left a complaint. After that whole ordeal I ended up ordering from Dominos and according to their website we were not in the delivery area either. So we went and picked up the pizza. I walked in by myself and walked up to the counter. A guy was working who well I can only say he looked like he was from Pearl. Totally nice guy though... for the most part. I walked up to the counter asked for my order and I saw his eyes wandering downward. I looked down and realized my shirt had become unbuttoned on accident. ACCIDENTAL CLEAVAGE! When he turned around I quickly fixed the problem. When he came back he saw I had clearly zipped up my jacket all the way and then asked "Hey honey let me see your shirt there" I was in such shock that he said that I started laughing!!!!! And I pulled the collar out and showed him it was purple HA! I got my pizza and then decided to ask "Do you happen to deliver to *insert Grants Address here*?" He then said "We do but you have to call you can't order it on the Internet. Actually hun if you had called me I could have given you a deal, But then your man might have gotten upset." Where I said "Oh hun he would have been furious!" He then said the skeeziest thing eva "You gonna come back to see me? Maybe alone next time?" I then laughed and started backing away... Then he said "At least bring a friend!" "Ok... Thank you!" and then I left. I then realized thanks to accidental clevage we can now get pizzas delivered to Grants house. So, what started out as a crappy night of fail and no pizza turned out to be a win. I will not order a pizza again from that particular Papa Johns ever again though. 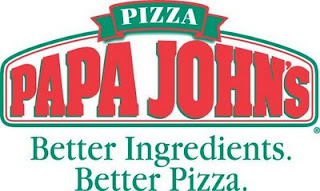 But I do recommend Papa Johns normally over any of the other delivery pizza joints. Anyway that was my lil rant on that. 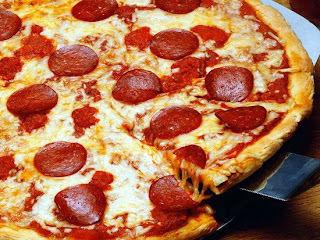 Whats your favorite Pizza? And do you have a Pizza Fail moment? Epic Win Story in the end..
wow !!! LOL WoW !!!! Thats one very unique Pizza story dont think anyone can top !!!!! I've encountered this same situation after moving further away from campus. It totally sucked. Now that I am back in the central valley, though, I get to enjoy the best pizza in the world once again: Me-N-Ed's Pizzeria. They're mainly only located up and down the central valley in California. The worst part of L.A. is the lack of any good comparable pizza places. My wife and I absolutely swear by Rosati's Pizza. They're popular in the Chicago area, where we're originally from. We were so excited when they finally came out here and started delivering in the area where we bought our house. Normally, they're excellent with orders and not screwing them up. Our first order was great. The second one, well, we got a fishy-tasting surprise when we bit into it. It had anchovies in place of our usual sausage and it wasn't readily apparent until first taste! I called them back and we got a new order, free. That was the only screwup they've ever done. Edit: we live in the Phoenix, Arizona area now. Didn't say that earlier.